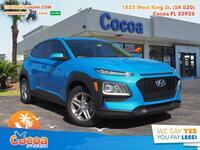 We are extremely pleased with the brand-new 2018 Hyundai Kona. It was finally unveiled in December, and it proved well worth the wait. 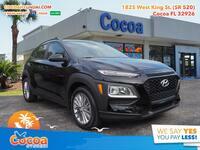 Now, it is another option available in the fast-growing sea of subcompact crossovers on the market, and we thought we would dive right into what makes it a better option than some of the other popular models on the market, first by comparing the 2018 Hyundai Kona vs 2018 Honda HR-V. 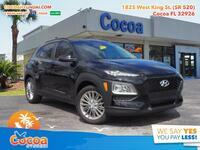 While some specifications have yet to be released, we wanted to get a jump start on comparing our entry into the subcompact crossover segment right away. So, we put together the table below, which we then analyze below that. Hopefully, this gives you a better idea of what the brand-new Kona has to offer, and that you’re as excited as we are that it’s available. 19.2 cu. ft. Cargo Capacity 23.2 cu. ft.
We start right off the bat with a nice advantage in the Kona’s favor, as the first row depicts that it offers an extra 6 horsepower more than the HR-V. That’s not a huge advantage, but it is an advantage. And it gets much bigger if you fast forward to the final row of the table, which shows that the Kona offers a more powerful, available engine option while the HR-V does not. That engine bumps power up to north of 170 horsepower, definitely expanding that advantage over the HR-V. The two middle rows look at fuel efficiency and cargo capacity, which is at least currently our weak points in the Kona. The HR-V offers an extra 4 cubic feet of room to fit whatever luggage or other cargo you need to bring along with you. However, we’re not sure if the HR-V has a leg up in efficiency yet or not, as the EPA has yet to announce official fuel economy ratings. 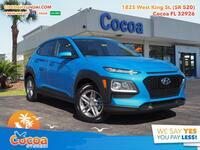 We predict that the Kona will at least be competitive, if not offer superior miles to the gallon. 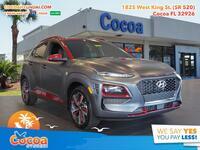 If you’re interested in a brand-new 2018 Hyundai Kona of your own, be sure to give us a call at the sales desk or schedule a test drive right here on our website.